THE LETTER fell onto the hall floor in the house at Main Street, Portrush, Co Antrim, in late April 1912. The letter may be one of the more interesting insights into character of Titanic Chief Officer Henry Wilde, First Officer William Murdoch, and Purser Hugh McElroy. Particularly on their final night alive. It extensively quotes from Second Officer Charles Lightoller, in comments made by him shortly after the disaster at the New York club for officers of the International Mercantile Marine (IMM), the Morgan shipping conglomerate, which included White Star. Officer Lightoller clearly believed he was speaking 'in lodge' at the club, on the west side of Manhattan, near the ocean liner piers. His private remarks about the tragedy, albeit reported as hearsay, may be important to the 'grey' historical record. Also quoted in the letter is Maud Slocombe, senior Titanic stewardess, who speaks of the attitude of surviving passengers on the Carpathia. The Portrush Letter is notable because its author, club chief steward John Smith, claims to have known all the prominent Titanic figures for many months prior to the tragedy. "I intended writing to you earlier in the week, but the awful disaster to the Titanic has put everything else out of my mind, and even yet I am waking up and thinking it is all a bad dream. People here who didn't know a soul on board have gone crazy, and as each of our ships come in it is pitiful to see some of the many who have lost shipmates of many years standing. It is a loss to me in many ways. I had known every officer and engineer on the Titanic for over fourteen months, and on the whole they were the finest type of men imaginable. Â“The papers here contain nothing but the Titanic tragedy, but I am disgusted reading their versions. They are only concerned about the amount of jewels Madam So-and-so lost, and seem indignantly (sic) that any of the crew should have been rescued at all. But not a single member of the crew took a place in the boats unless those who were required to man them. "The officers who were saved jumped into the water after the last boat had left, and some of them actually waited until the ship sank under their feet. I think two hundred saved out of almost nine hundred of a crew speaks well for the way in which they stuck to their duty. "The account I got from the surviving officers, I am sure, is as near the truth as will ever be known. Mr Lightroller (sic) , the second officer, comes in for very high commendation from the papers and deserves it all. 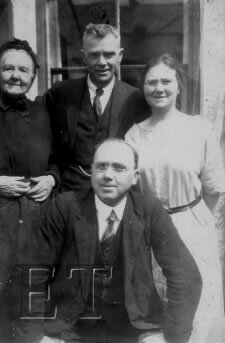 Mr Hardy, the Chief second class steward, who is a close friend of mine, told me how Mr Lightoller filled his boat, and then put someone in the place he himself should have occupied, saying he'd stick by the ship. He went down with her, but was picked up later. [Chief second class steward John Hardy (pictured below), 36, was ordered into Collapsible D on the port side by Lightoller Br. 14030. It is impossible for me to send you all the papers, but I send you a Â‘Sun', which is as just a paper as there is in New York. I wish you to read Mr Lightoller's testimony, as it will give you an idea of his modesty and of the way he keeps his wits about him. "Mr Wilde, the Chief Officer, and Mr Murdock (sic) , the first mate, were splendid types of men, and old Captain Smith was beloved by everyone. I knew all the engineers personally and their case is the most pitiful of all, for they must have known first that the ship was doomed, yet not one of them left his post. "There were thirty-three regular engineers, six electricians, and probably forty engineers from Harland and Wolff's. Poor Dr O'Loughlin. He used to ask me to telephone for him as he said people couldn't understand his "French" accent . Â“I can only say that the Titanic crew were the pick of the White Star Line. Â“The last seen of Mr Wilde he was smoking a cigarette on the bridge. I expect he was hoping the water wouldn't put it out before he finished it. His wife died about sixteen months ago, and I have heard him say he didn't care particularly how he went or how soon he joined her. He leaves three children. Â“He would have been Captain of the Cymric two trips ago, only the coal strike and the tying up of some of the ships altered the company's plans. "Mrs Slocum (sic), the Turkish bath attendant, told me that when the survivors were coming here on the Carpathia she repeatedly heard some of the Â‘ladies' express disgust that Â‘these common women of the crew' were taken off and their men left. "I don't think he (McElroy) got down so far, for he was a clean big fellow." Here the letter, which was part-published in the May 11th edition (page nine) of the Northern Constitution, a newspaper based in Coleraine, Northern Ireland, lapses into other subjects. (14766) The last I remember seeing of Mr Wilde was quite a long time before the ship went down. Yet the account given in the letter echoes a claim about the last sighting of Wilde that was carried in the Cornish Post of May 2, 1912. [This supplied by Inger Sheil]. And so this is the Portrush Letter, with its interesting new suggestions about a night of tragedy. It nonetheless remains hearsay, with concomitant caveats. 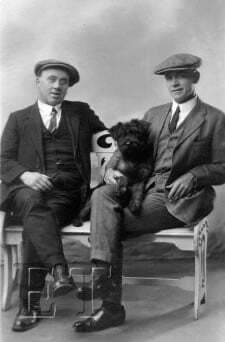 The pictures shown here of Hugh and John Smith were taken circa 1924. They are supplied courtesy of John's grandson, Dan Moore of New York. John Smith was born in 1881 and died in 1954, and was therefore aged 31 at the time of the Titanic tragedy. His grandson has vague memories of him sitting in a big stuffed chair. Â”We are indebted to Mr Hugh Smith, Main Street, Portrush, for the following interesting letter which he received from his brother, who occupies a responsible position in a New York club much patronised by officers of the Mercantile Marine. A shorter version of this article appeared in the White Star Journal (September 2002) and the On Watch website.